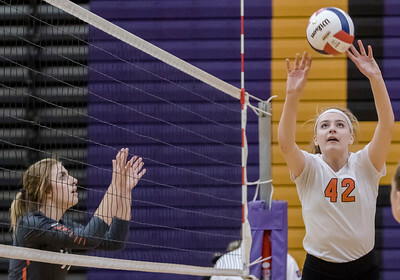 Sarah Nader - snader@shawmedia.com Crystal Lake Central's Madelyn Blake hits the ball over during Monday's Class 4A Wauconda Sectional match against Libertyville Oct. 30, 2017. 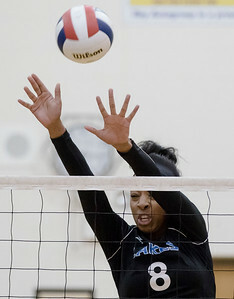 Crystal Lake Central won, 25-18, 25-13. 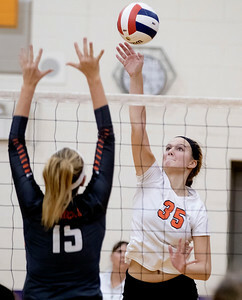 Sarah Nader - snader@shawmedia.com Crystal Lake Central's Megan Kelly sets the ball during Monday's Class 4A Wauconda Sectional match against Libertyville Oct. 30, 2017. Crystal Lake Central won, 25-18, 25-13. Sarah Nader - snader@shawmedia.com Crystal Lake Central's Paige Hulata jumps to block a ball during Monday's Class 4A Wauconda Sectional match against Libertyville Oct. 30, 2017. Crystal Lake Central won, 25-18, 25-13. 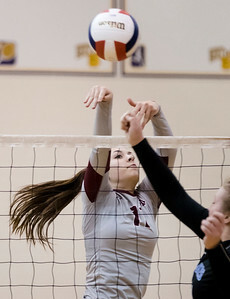 Sarah Nader - snader@shawmedia.com Prairie Ridge's Olivia Annen hits the ball over the net during Monday's Class 4A Wauconda Sectional match against Lakes Oct. 30, 2017. Prairie Ridge won, 25-14, 25-16. Sarah Nader - snader@shawmedia.com Prairie RIdge's Mackenzie Garis returns the ball during Monday's Class 4A Wauconda Sectional match against Lakes Oct. 30, 2017. Prairie Ridge won, 25-14, 25-16. 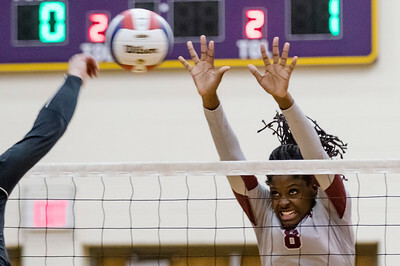 Sarah Nader - snader@shawmedia.com Prairie Ridge's Trinity Sheridan blacks the ball during Monday's Class 4A Wauconda Sectional match against Lakes Oct. 30, 2017. Prairie Ridge won, 25-14, 25-16. 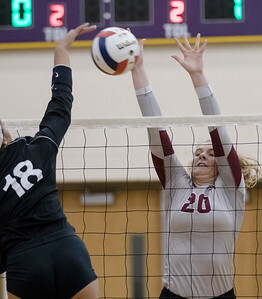 Sarah Nader - snader@shawmedia.com Prairie RIdge's Jayden Otto blocks the ball during Monday's Class 4A Wauconda Sectional match against Lakes Oct. 30, 2017. Prairie Ridge won, 25-14, 25-16. 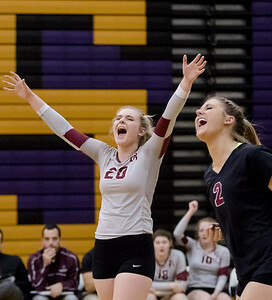 Sarah Nader - snader@shawmedia.com Prairie RIdge's Jayden Otto (left) and Mackenzie Garis celebrate a win during Monday's Class 4A Wauconda Sectional match against Lakes Oct. 30, 2017. Prairie Ridge won, 25-14, 25-16. 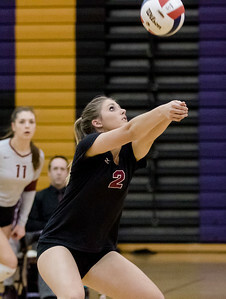 Sarah Nader - snader@shawmedia.com Lakes' Paule Ceneac blocks a ball during Monday's Class 4A Wauconda Sectional match against Prairie Ridge Oct. 30, 2017. Prairie Ridge won, 25-14, 25-16. Sarah Nader - snader@shawmedia.com Crystal Lake Central's Madeline Timmerman (left) blocks a ball hit by Libertyville's Kellie Hopper during Monday's Class 4A Wauconda Sectional match Oct. 30, 2017. Crystal Lake Central won, 25-18, 25-13. 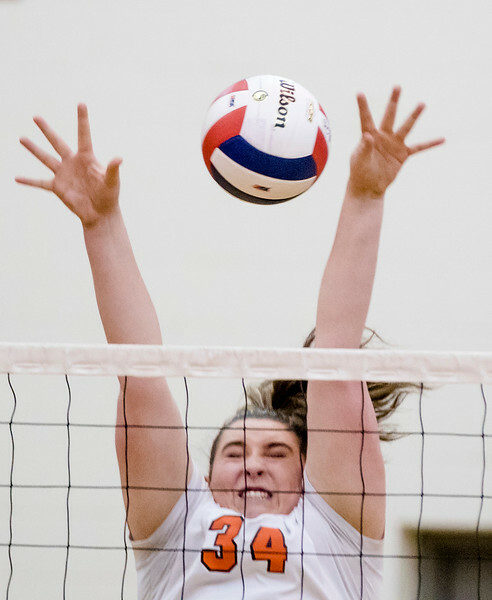 Crystal Lake Central's Paige Hulata jumps to block a ball during Monday's Class 4A Wauconda Sectional match against Libertyville Oct. 30, 2017. Crystal Lake Central won, 25-18, 25-13.